Land scarcity for new projects has prompted developers to think differently about hotel properties. Developers are looking at condo hotel developments and a more viable and profitable solution is to remodel an existing hotel property and convert it into a condo/hotel. While this is not a new idea, it has certainly becoming more ubiquitous, and soon to be a lasting trend. 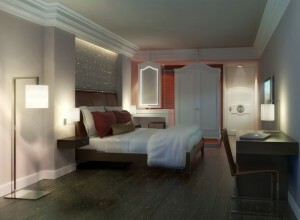 Many high-end hotels under development have included a condo component. It is the perfect adaptation for cool, independent boutique hotels striving to show their individual personality and a wonderful match for those discerning, lifestyle craving unit owners from all over the globe searching for a second home. For our clients, the developers or owners of the hotel, transforming into a condo-hotel is a fantastic option as they are able to sell the units and use these pre-construction sale deposits to carry them over the pre-opening, meanwhile still maintaining a good portion of their own hotel units, as well as any restaurants, meeting rooms, spas, and common areas. A condo-hotel requires a much higher level of expertise to be managed properly. Developers often forget the hotel portion as so many are used to building, selling and leaving and they are completely unfamiliar with the very real notion of hotel operations. That demands a great vision, a wonderful story that draws you in, and an equally strong operational platform. Once the condo units are sold, if they aren’t fully occupied, a developer will have a building full of angry buyers. The hotel has to be very effective in its marketing so that guests will actually want to stay there. It has to be efficient, so it will be profitable. BHM has experience with vacation ownership be it timeshare or condo-hotel. Examples include The Pelican in Fort Lauderdale, The Angler’s in Miami Beach (which later removed the condo component and became strictly hotel units), the Savoy in Miami Beach, the DoubleTree in Fort Lauderdale (association portion only), and we have begun managing Mantra on Isla Pastor, Republic of Panama.